My reasons for traveling was a bit different this time. My trip wasn’t only about visiting different places but also the experience of taking my “work” with me and being away from home for longer periods. 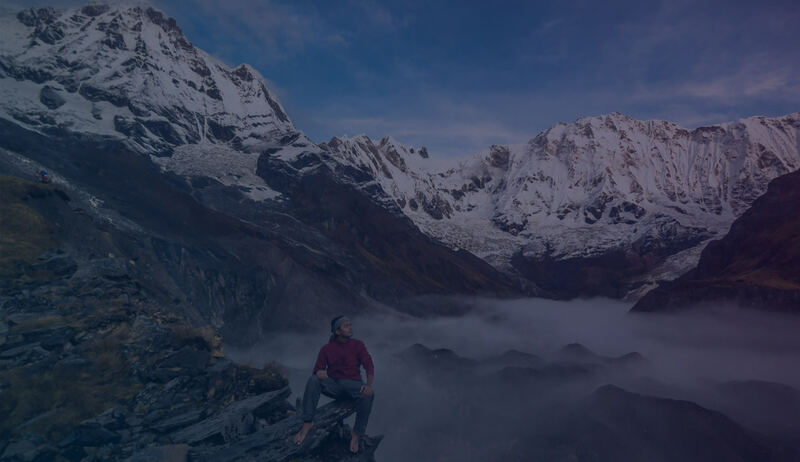 I wanted to fully experience living a location independent lifestyle and was determined to know if a nomadic life was really something I would find fulfilling. I didn’t plan an itinerary. 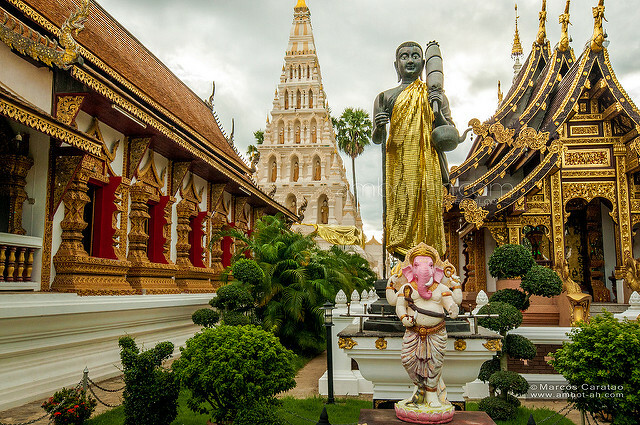 All I started with were my flights to Chiang Mai and enough money to last me a couple weeks of backpacking. 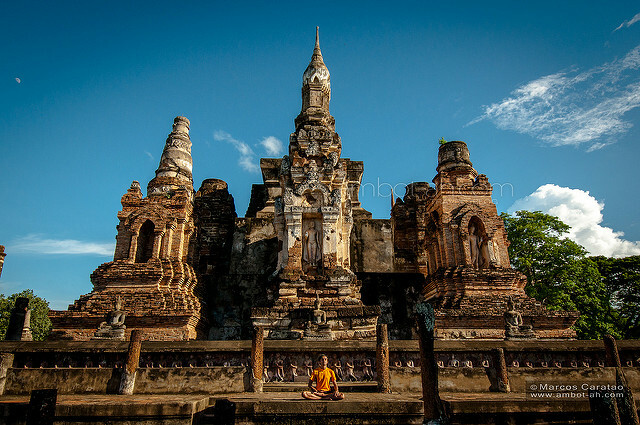 I spent the first three weeks of my trip in the Northern Thai city of Chiang Mai then, with a little more than a week before my tourist visa expired, I did a loop around few more tourist spots in Northern Thailand before crossing the border to Laos. 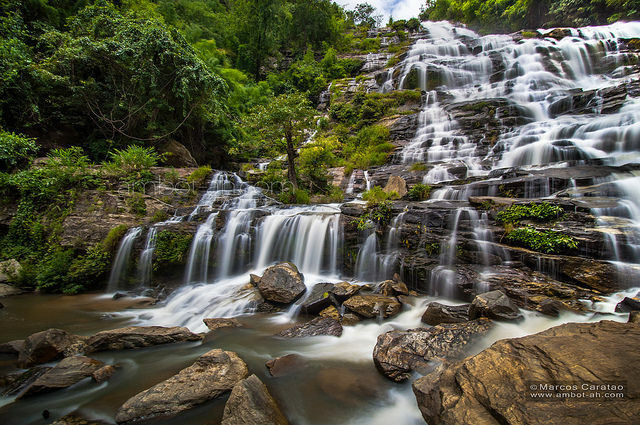 The main areas I visited included Umphang Rainforest in Tak province, Kamphaeng Phet, Sukhothai, Phrae, and Chiang Rai. 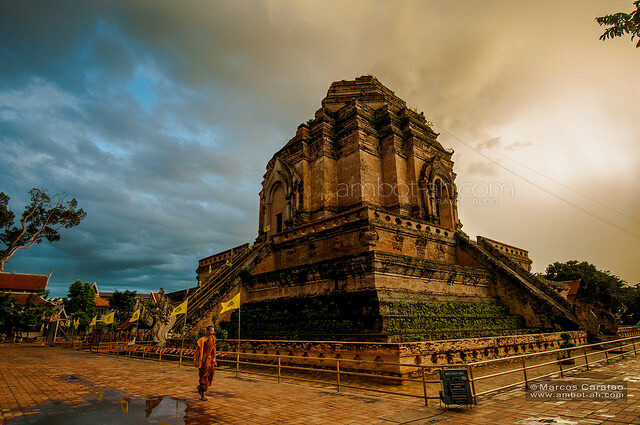 Chiang Mai, known as the cultural and tourism capital of Northern Thailand, had roughly 300 Buddhist temples scattered around the city and its outskirts. 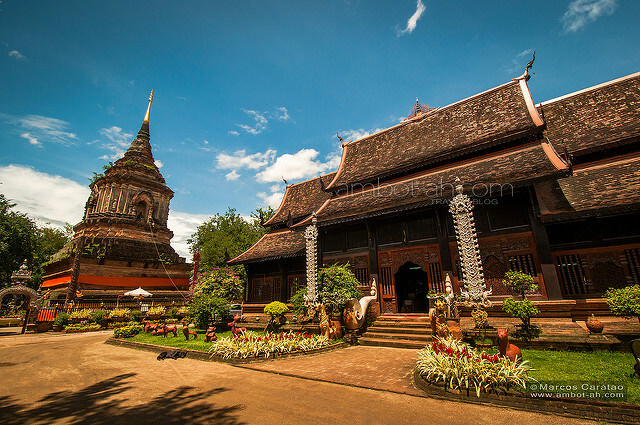 Wandering around these historic attractions was the main tourist activity in Chiang Mai. Additionally, the city was also a popular base for trekking and elephant park tours. I started most of my mornings in Chiang Mai with cheap breakfast and coffee at the local market. 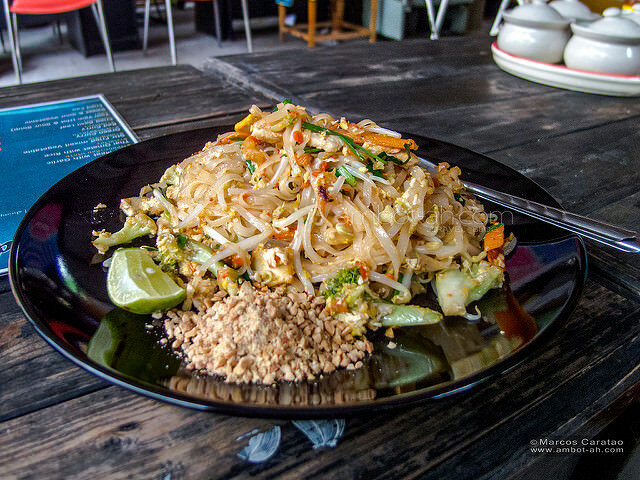 Then, I’d take the bicycle out or walk to nearby temples and discover the gastronomic goodness that is Thai street food. 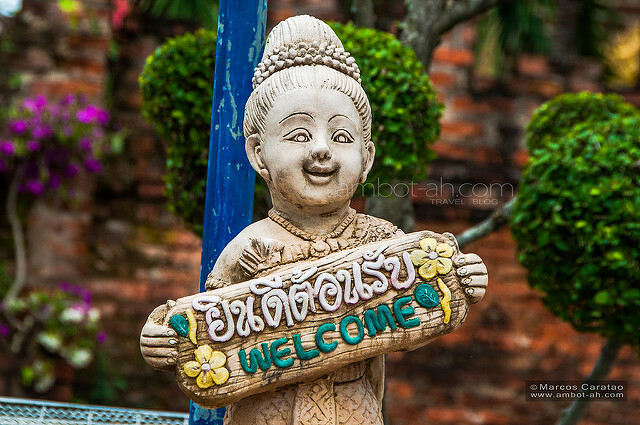 I loved my short stint at “living” in Chiang Mai. Now I understand who so many bloggers raved about this city being one of the best places for location independent lifestyles. The city was peaceful and urbanized, modern conveniences within an easy walking distance, and most of all, cheap. 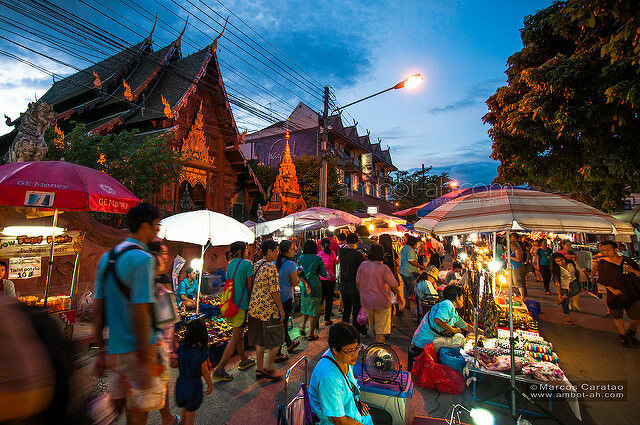 A thrifty backpacker can budget around US$6-10 per day in Chiang Mai. 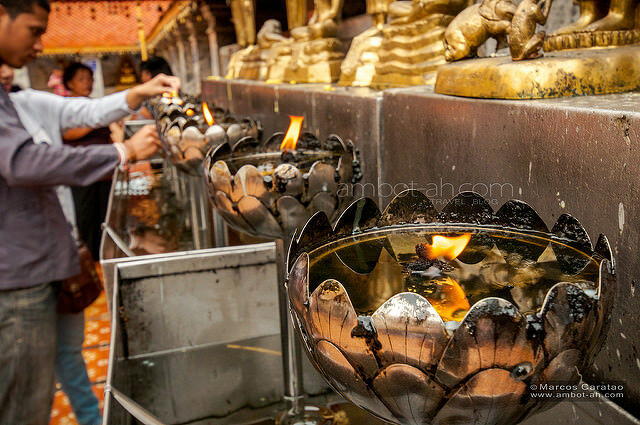 I suffered from “temple fatigue” a few times after going overboard with my temple visits. Fortunately, I wasn’t in any rush and could spend the next day doing less intensive activities… like going to the mall :) So Filipino. 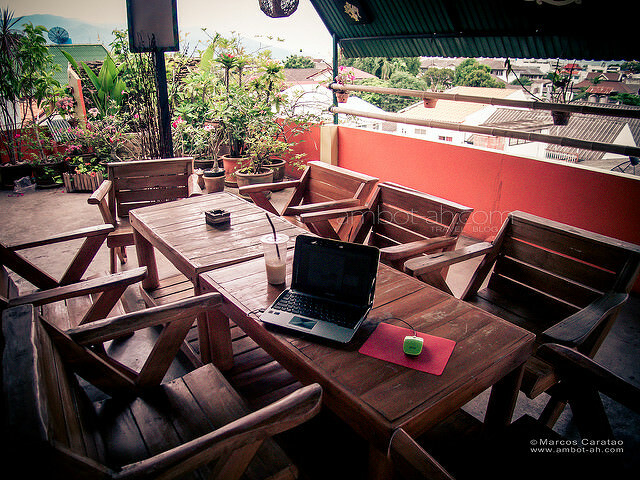 My “workspace” at the rooftop terrace of Malak Guest House. Wat Chiang Man, the first temple in Chiang Mai, located a block away from my hostel. 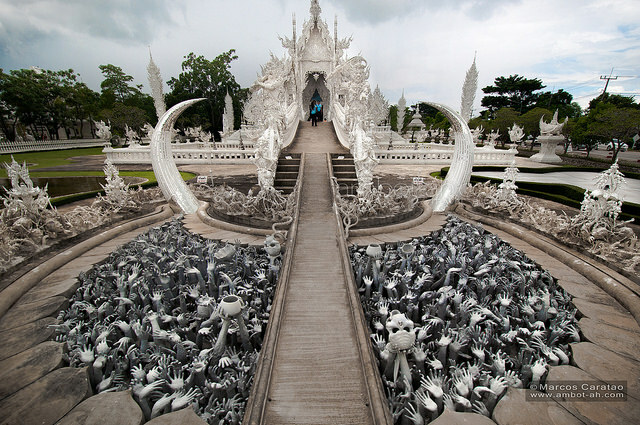 Visiting the Silver Temple with another Filipino travel blogger, who was also traveling in Chiang Mai at the time. 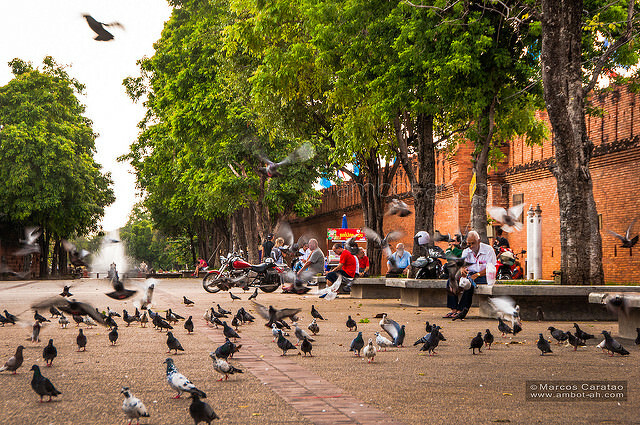 I also got to wander around a few interesting spots outside Chiang Mai City Center. 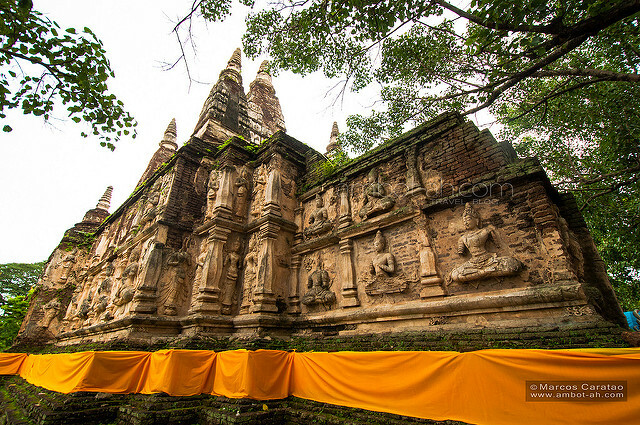 The first ones I visited were Wat Chedi Liam and Wat Jed Yod, which were accessible by bicycle. Wat Phrathat Doi Suthep was a bit far and needed a ride aboard the local pick-up truck. 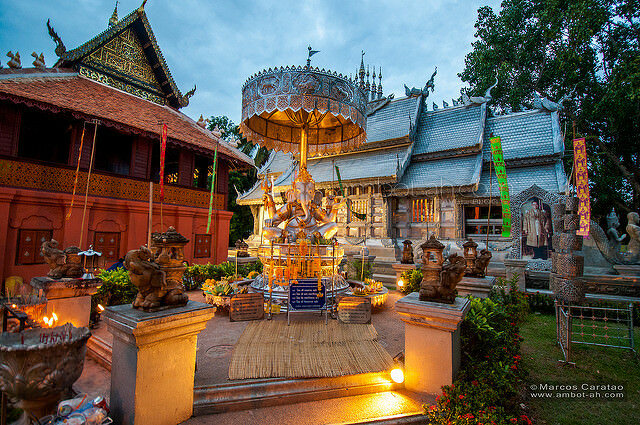 Not only was it the most famous Buddhist temple in Chiang Mai, its hilltop location offered great overlooking views of the whole city and outlying towns. 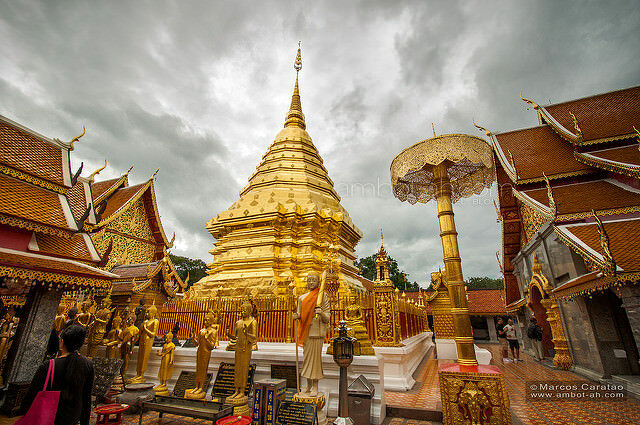 Doi Inthanon, the tallest mountain in Thailand, could be easily conquered by joining one of the tours offered in Chiang Mai. Since my visit coincided with the rainy season, I wasn’t too interested in visiting the summit. I didn’t want to get disappointed by heavy clouds blocking the view. I was, however, really excited to go to Doi Inthanon to visit its waterfalls, which should be at the peak of its beauty around that time. Mae Ya waterfall particularly stood out. Its impressive size and fan-like cascades were unbelievably stunning. Best of all, I had the waterfall all to myself! No other tourists around because the waterfall wasn’t included in most of the “tour group” itineraries. I had to go there DIY style. Now it was time for the main course: trekking to Thee Lor Su, the highest and largest waterfall in Thailand. To get there, I got on the bus to the Thailand-Myanmar border town of Mae Sot, then rode aboard the long pick-up truck ride to Umphang, situated deep in the rainforests of Tak province. 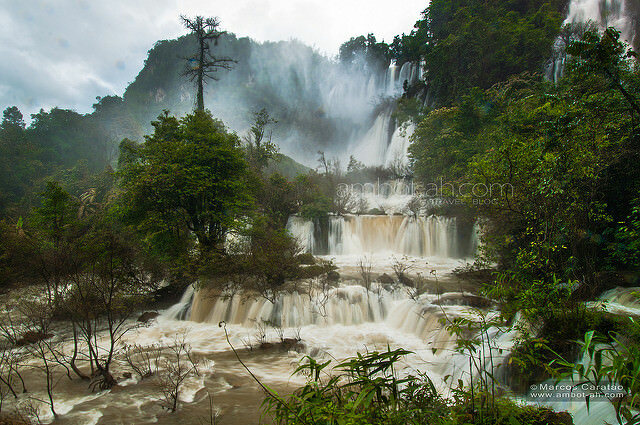 Fortunately, there was a group of Spanish backpackers who also wanted to see the waterfalls when I arrived in Umphang. 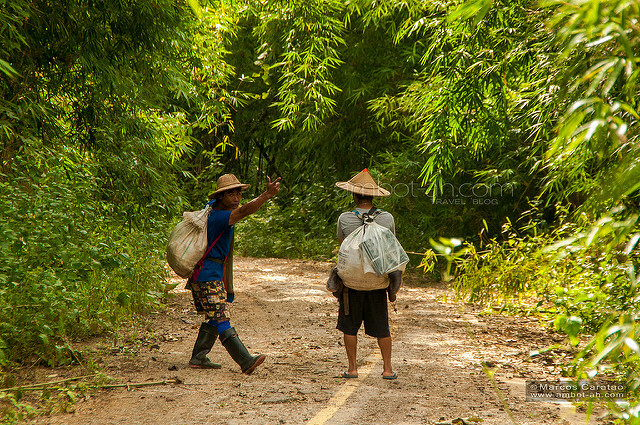 We booked an overnight trekking tour to Thee Lor Su, which involved a scenic 4-hour river cruise on a slow raft and another 4-hour light trek to the campsite near the waterfall. Top loading a songthaew (local pick-up truck) on my way to Umphang town. 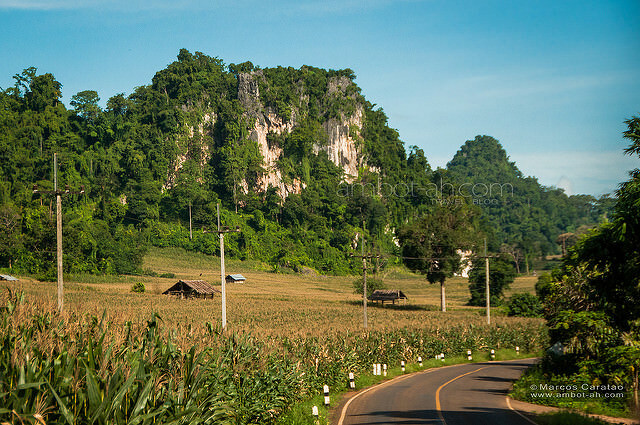 Beautiful countryside views on the ride from Mae Sot to Umpahng. 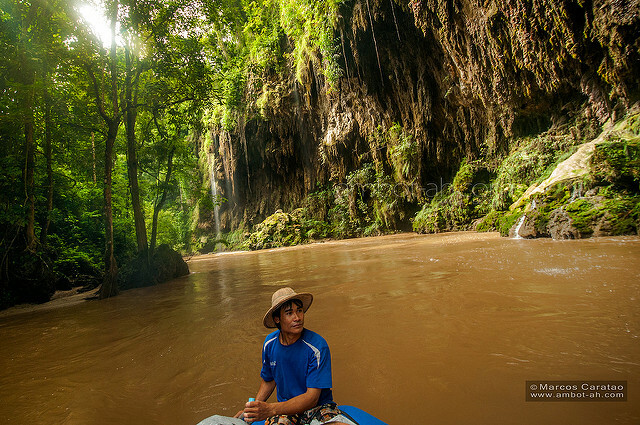 Our awesome guide masterfully navigated our slow raft through the scenic Klong River, which was bordered by thick forest and tall limestone formation. Some even had waterfalls flowing down its rugged walls. Our trekking guide goofing around during our the trek to the camp site. Finally, the view of Thee Lor Su Waterfall. The rainy season wasn’t actually the best time to visit the falls. The strong water flow filled the whole area with a thick haze of cold mist. 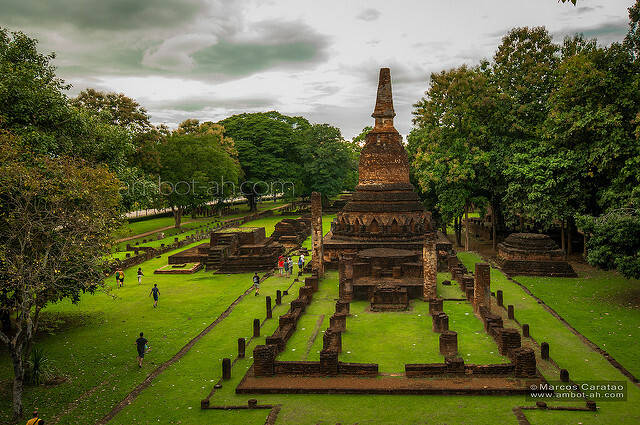 The remnants of the ancient Sukhothai Kingdom was a popular backpacking destination in Thailand. 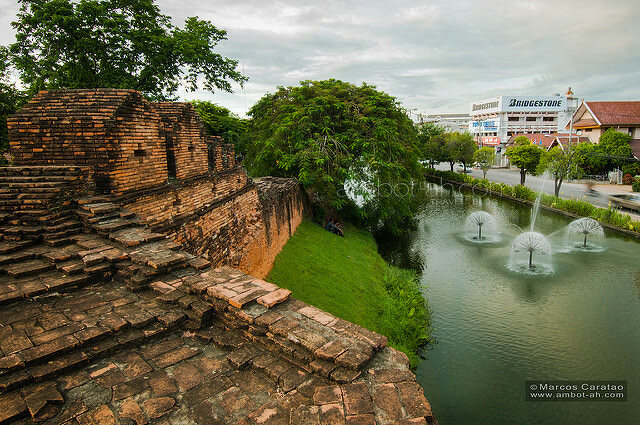 UNESCO included Sukhothai ruins in its list of world heritage sites under the category Historic Town of Sukhothai and Associated Historic Towns. 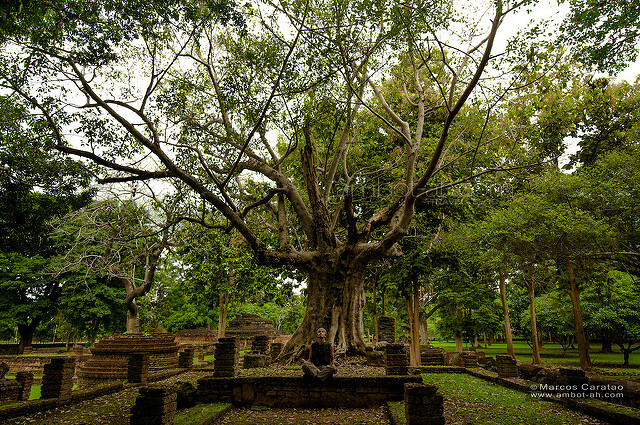 Kamphaeng Phet was one of these “Associated Historic Towns” that tourists often overlooked. 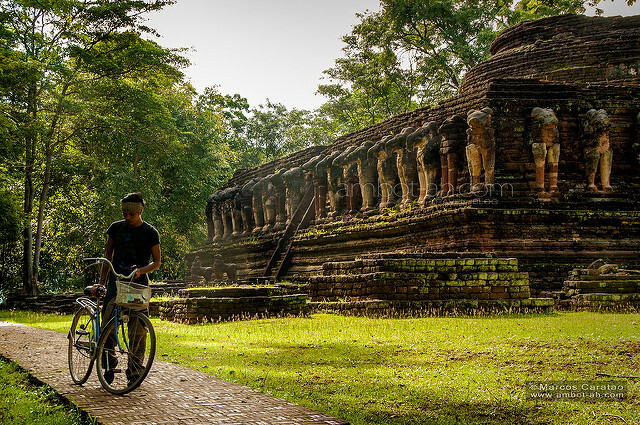 I enjoyed cycling around two of the bigger temple complexes at Kamphaeng Phet without sharing the space with bus loads of tourists. Most people I met were Thai tourists and locals doing their afternoon jog around the historical park. 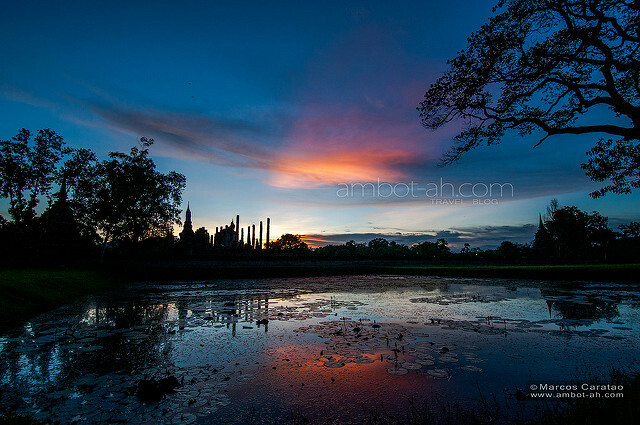 Sukhothai Historical Park was also beautiful and worth a visit. The temple ruins were larger and more impressive. There were also more tourists around, though. On my way to Chiang Rai, I broke the long land journey by spending one night in Phrae, a peaceful town 120 kilometers north of Sukhothai. 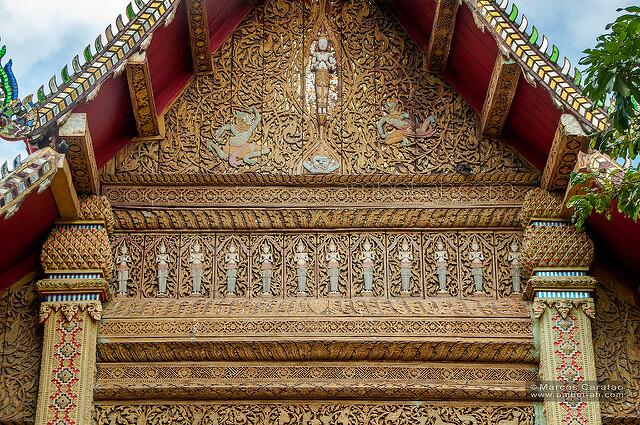 Phrae was a charming little town with a couple of interesting sights like old teak wood houses and temples. The main draw there, however, was the experience of being on the non-touristy side of Thailand. 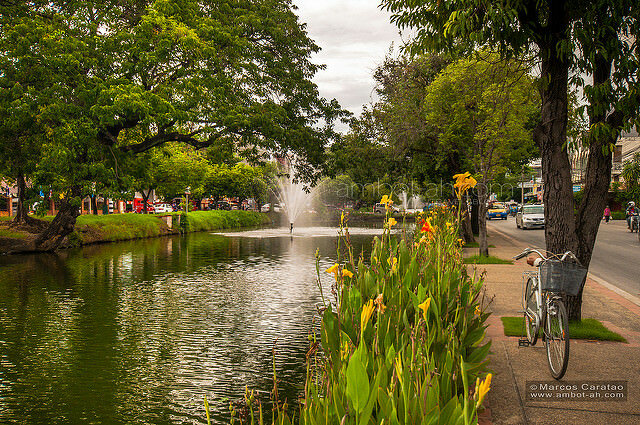 Chiang Rai, the northernmost major urban center in Thailand, was an excellent place to visit for a few days before crossing the border to Laos. 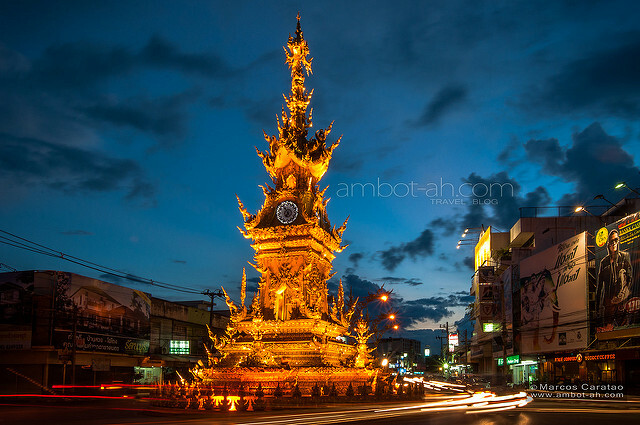 The city seemed like the awesome “wicked” little sister of Chiang Mai. I had been waiting all month to see the insanely interesting conceptual architectures of the White Temple and the Black Houses. 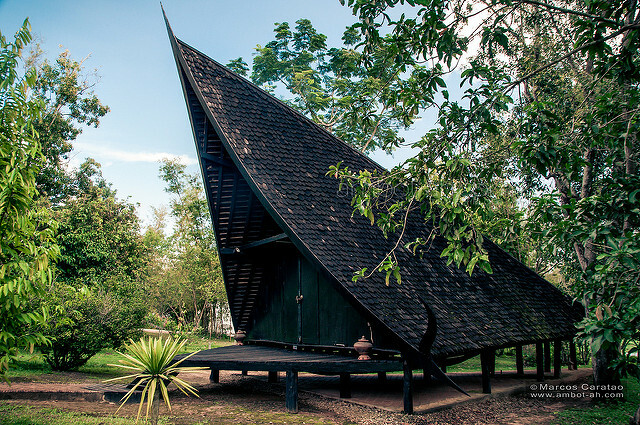 The biggest out of nearly 40 mysterious black houses, built on the outskirts of Chiang Rai. 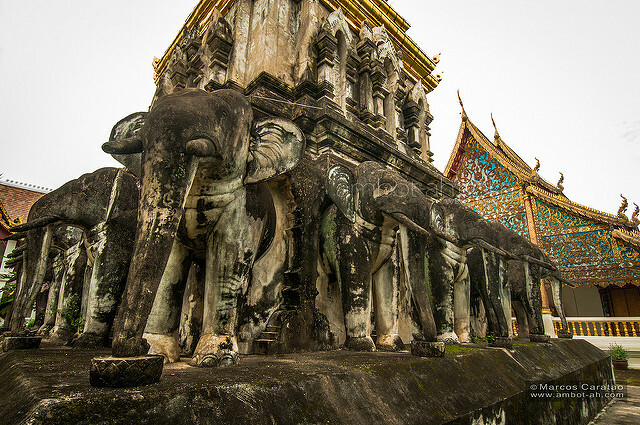 These structures exhibited the work of Thai National Artist, Thawan Duchanee. One of the devilish black houses that caught my attention. 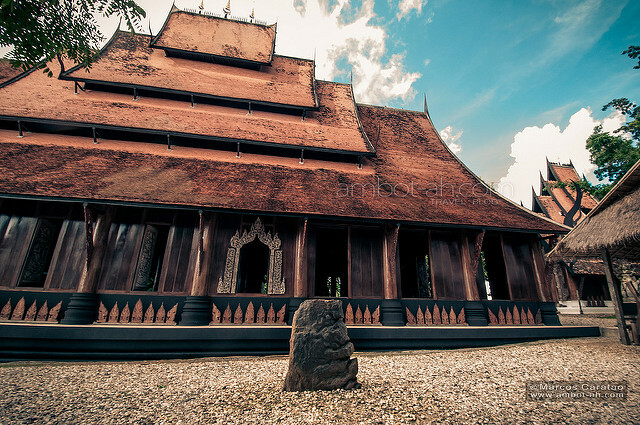 Almost all of the structures had bizarre and innovative designs that played with the mix of traditional Thai elements and modern contemporary concepts. 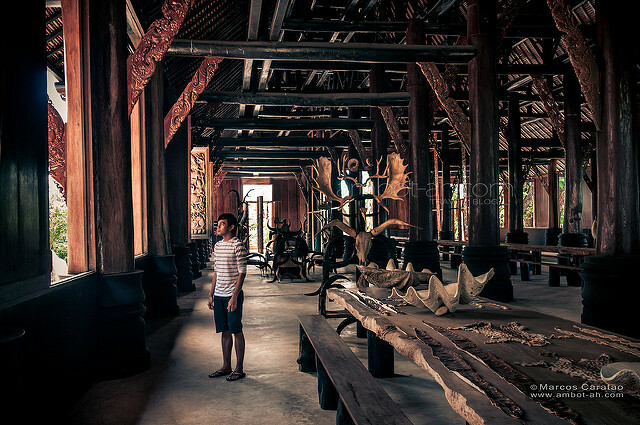 Looking out from inside the main hall, which was filled high teak wood beams and long tables laid out with beastly remains like with animal skulls, deer horns, leopard, and snake skin. great photos. 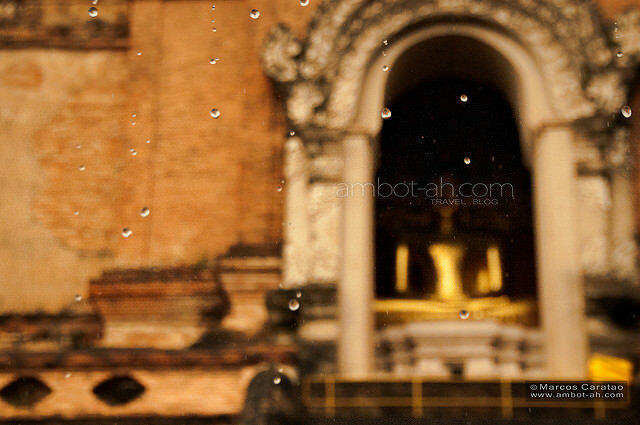 and you visited Wat Lok Molee, my favorite temple. Chiang Mai does get you templed-out at times. but yeah, I liked the city because it doesn’t force you to see the sights. doing nothing just taking in the atmosphere (and the food) is completely acceptable. Another awesome set of photos. wish i had the time to travel like you do. Sohoooobrang! Namimiss ko ang Chiang-Mai! Ang saya dyan! Simpleng buhay. Definitely a place I can live in. Amazing shots….feasting my eyes on ur shots mesmerizes me, as if im travelling wd ds places too..keep up the good work! you reminded of me except that i dunno how to set up a website and not a professional photographer ( i dont even have a dslr cam coz it’ll bug me down reading a manual beside i was abit expensive)… i love to travel especially solo and usually off-the-beaten tracks. that made me felt in love with the nature and the Philippines. few travel blogs have really kept me interested like solosister and journeyingjames and now your blog added to my local list that really perks my interest in travel. Nakakaexcite yung Indochina mo! More specifically etong Thailand na part. Nagbook ako for 8 weeks, arriving in Cambodia and going out of Thailand. haha Sana wala tayong visa limit sa Thailand para pwedeng mas matagal! Sana nga! Abanagan ang 2015. Let’s see how much integration there will be between ASEAN Countries. also, I’m curious…how did you find the location independent lifestyle? 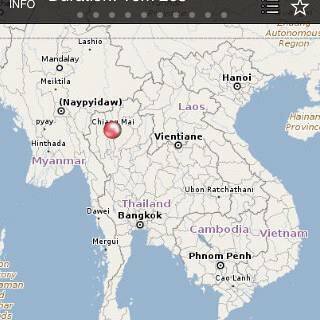 Thanks friend :D Yeah, andaming pwede magawa sa Chiang Mai and surrounding areas. Even though it can get touristy, there were always a lot of off beat things to do. Personally, if I had the choice, I can do away with living a fully location independent lifestyle. I love living in Iloilo too much maybe, hehe … but I am comfortable with location independence if it means being able to live my dream of traveling indefinitely. Ang perfect scenario ko talaga… being based in Iloilo and then being able to travel anywhere anytime. This is, unfortunately, impractical for me right now. 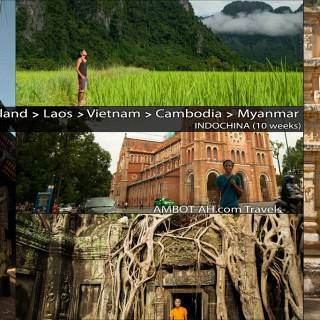 I can maximize my budget better if I travel more long term. You are a very talented photographer! 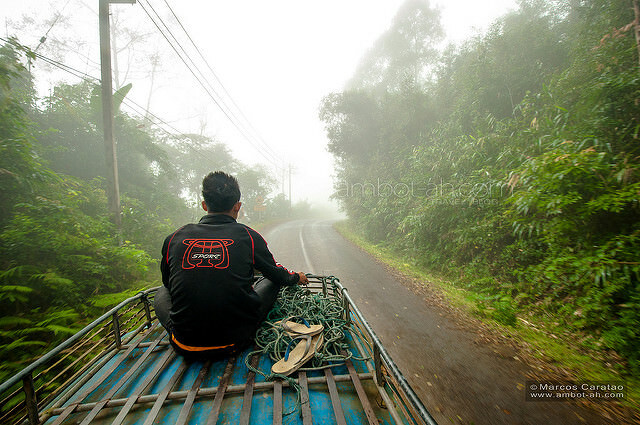 Even your cloudy pics from Laos are stunning. I particularly love the colours, compositions and perspectives. Keep it up!